Jesska Denise: Toni&Guy 'Shine Addiction Straightening Glaze'. 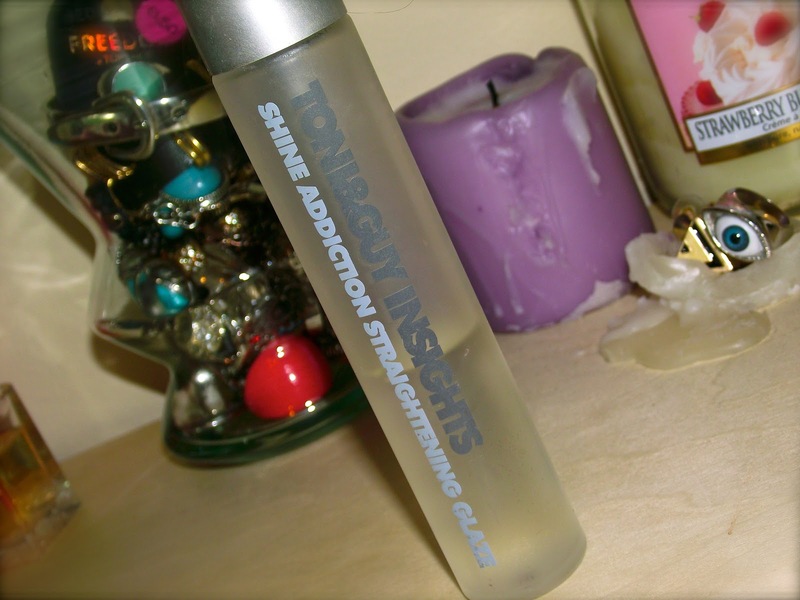 Toni&Guy 'Shine Addiction Straightening Glaze'. When it comes to hair products I always find them a bit hit and miss. There's so many products on the shelves claiming to give you soft, glossy locks that look more Victorias Secret and less Geordie Shore but the reality is only a fraction of these actually do as they say. Toni&Guy 'Shine Addiction Straightening Glaze' however, really does as it says. For me hair care is really up there. After years of dying and burning it half to death with a straightener my hair is currently at the stage where it looks pretty good. Its growing out at a pretty decent rate and feels more like hair and less like dry hay than it has in years. My main problem though is achieving a lovely healthy shine and with this little treasure I'm cheating my way there. When straightening my hair I pile it into three sections and give each section a light spray. I then proceed to straighten the area I've just sprayed and voila - I've got lovely shining hair that would give Lily Aldridge a run for her money. Have you guys ever tried this or something similar? Leave a comment below. I've never heard of this product before but being the obsessive beauty hoarder I am, this is definitely something I'd invest in! Thank you so much for the review! Hahah the Victoria secrets vs Geordie shore made me laugh because its so true! Haven't seen this yet but sounds like something I'd actually love! Thanks for sharing your review on this product lovely, definitely something I'm interested in trying!